So, you had a dope Hoopmixtape in high school… awesome. You were the highest recruit in the country coming out of high school… sick. You averaged 15.5 ppg for a top-5 Duke team in only your Freshman year… dope. In the 2012 draft, the New Orleans Hornets chose you with the 10th pick… wicked. And that’s when it all went downhill. Now, we know expectations have been high for the young guard, but only because he made them high. In an interview during his rookie season, Rivers said, “I want to be like my father [Doc Rivers], but better.” Woah woah woah, hold it there pal! Is that what just came out of the mouth of the first-round draft pick that only averaged 6 points a game for a 27-55 Hornets squad? I didn’t think so. So, fast-forward to his fourth year in the league. The production is still not there from the guard with seemingly so much potential. What would any sane GM do? Trade him. And that’s exactly what the Pelicans did: send him to Boston as a bonus in the Jeff Green trade. Then, what do you know? The Celtics don’t want anything to do with him, so they send him away in a three-team deal for essentially nothing. But Austin, we understand. Surviving in the league today is not easy. Maybe the chemistry and schemes of the Pelicans weren’t right for you. Maybe you just need another chance. 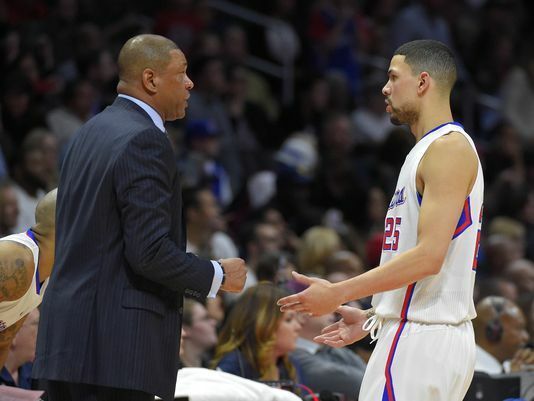 And who better to give you that chance than your own father, Doc Rivers. After a few years of struggling in Louisiana, Rivers has an opportunity to prove to all the critics that he is worthy of playing in the NBA and to revive his reputation. But, Austin Rivers pulls an “Austin Rivers” and blows it. In three games and 43 minutes of playing time, Rivers makes 1 field goal with 3 turnovers and 3 points. How do you even do that? Were you even on the floor? I seriously think that Derrick Rose had a better efficiency than that last year, and that’s low. Daddy’s doing all he can, Austin, but you’re just a bad basketball player and you should consider retiring from not just the NBA, but the entire world of sports.